In the summer creating shelter from winds may not be such a big issue, but on sunny days in the spring and autumn, shelter from cold winds can turn an otherwise unusable space into a cozy oasis. 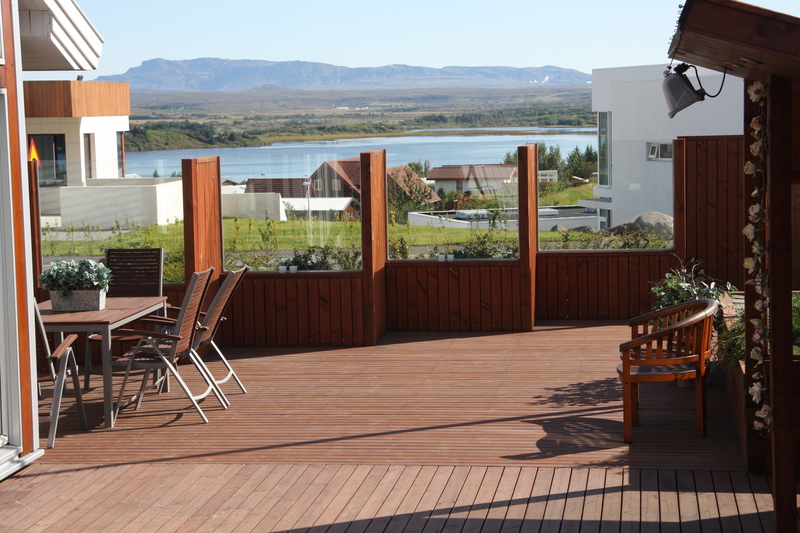 In this way the outdoor living season can be lengthened by a few months, both in spring and autumn, which in cold climate northern countries like Sweden and Iceland can be quite important. The first step is to assess the wind in your area and your garden. Prevailing winds are different for every area. In the Reykjavik area, where I have designed most of my gardens, prevailing winds are southeasterly when it rains but northerly in sunny weather. In Stockholm southwesterly winds are the most common as well as a strong sea breeze from the south and east on warm days. The areas already sheltered from winds in your garden are determined by the size and location of existing buildings, other structural elements and vegetation. By assessing the prevailing winds, both by standing in the garden and with the help of Google, you can determine which areas are already sheltered and which ones need additional sheltering elements. The following pictures show garden design ideas for creating more shelter in your garden, by adding built elements to your space. 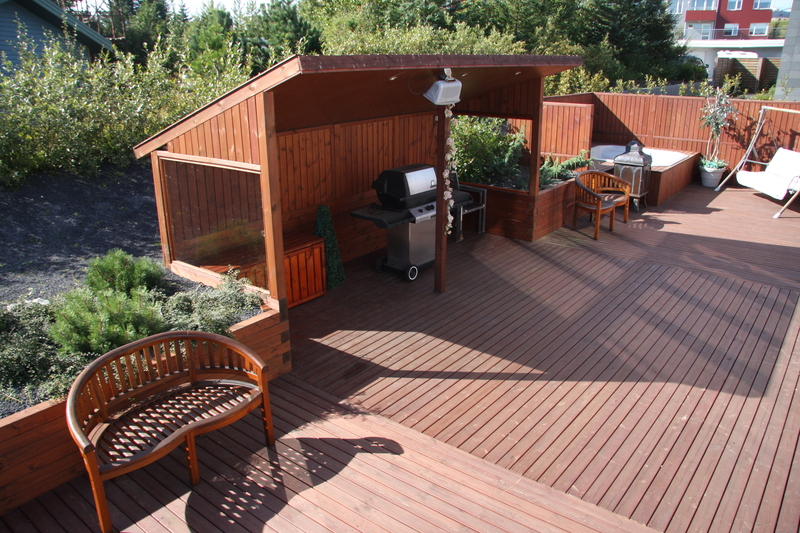 With a roof, three walls and a heater you can create the perfect space for barbecuing and enjoying those days when shelter from wind and rain is needed. These simple structures offers a great place for barbecuing. With a sloped roof, the smoke from the barbecue has an easy escape route. The glass windows in the side walls shelter from winds but allow the light to get through, creating a bright space with ample room for a barbecue and and a dining table with chairs. The ceiling is equipped with built in lighting and an electric heater making this the perfect place for late autumn outdoor living. This deck is sheltered from winds with a timber and glass wall retaining the view of the nearby lake. Sometimes a slow, but cold breeze makes trying to laze in the garden almost unbearable. In this garden a cold breeze from the lake can create a chilling effect on sunny days. By using glass in the fence structure the effects of the wind are ameliorated while keeping the view of the lake and mountains intact. Sheltering fences with built in storage units create shelter for the hot tub area and other spaces in this garden. When sturdy fences are needed for shelter, building a storage shed may be a great way to combine the functionality of a shed and the shelter from a sturdy wall. 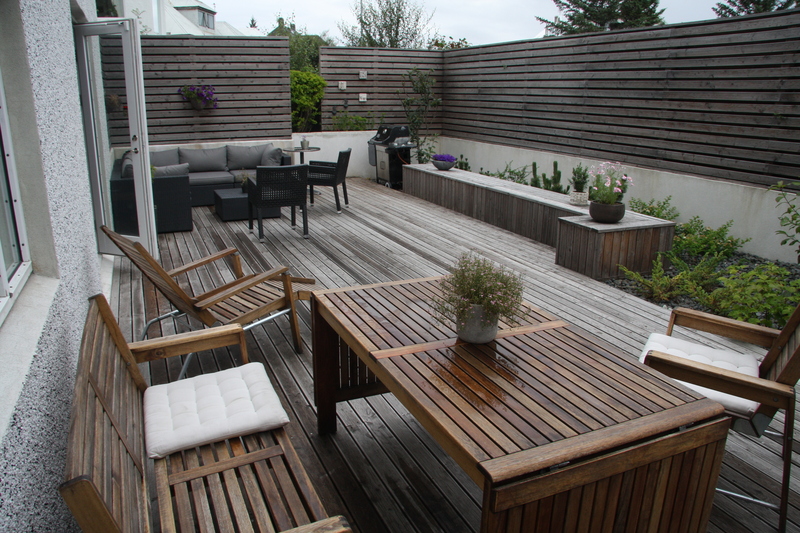 In this Reykjavik garden where strong northerly winds can create chilling effects, the shed on the fence is a sturdy sheltering element for both the hot tub and the rest of the deck area. By moving all or part of your garden to a lower level the sheltering effect can be increased. 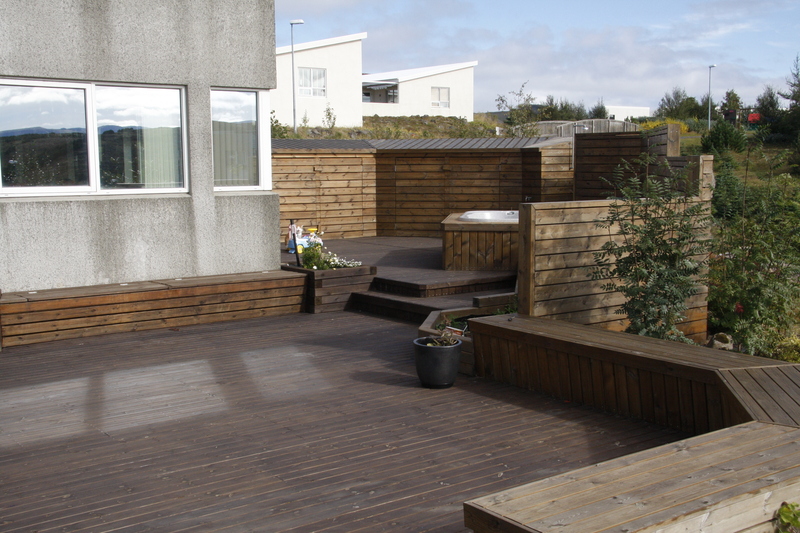 When the owners of this Reykjavik garden decided to add a new door to their ground floor it was obvious that digging out the connecting area would result in a well sheltered outdoor space. In keeping with a low-maintenance strategy the retaining walls are made of durable concrete and the deck and sheltering walls of weathered larch. By lowering an area, shelter from winds can almost always be increased. 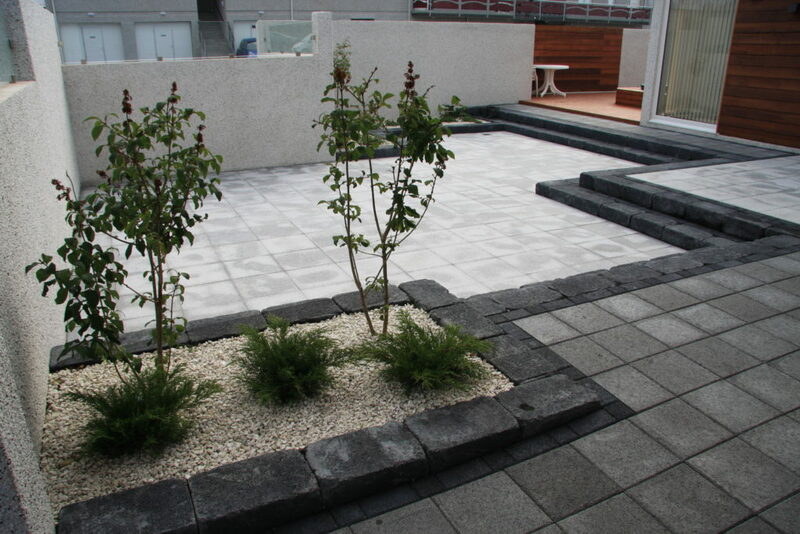 Surrounding your patio area with walls is often a good idea. In this way all light breezes will be directed away from the area as well as the prying eyes of nosy neighbours averted. In very windy areas this type of design should be well thought out because, if designed incorrectly, it can create unwanted turbulence when wind speeds are high. A great design feature, but use with care!